Before you start shopping for a new garage door, learn what you should be looking for and get a sense of the vast possibilities this popular home improvement offers. Americans love cars. For evidence, look no further than the design of the average postwar home. The garage often claims front-and-center position on the facade, making it as convenient as possible for drivers to come and go. Though the garage itself is usually a markedly utilitarian space, the garage door, because of its prominent placement, plays a big role in defining the outward appearance of your home. If, after years of hard use, your garage door is looking the worse for wear—or if it was never particularly attractive in the first place—replacing the old door gives you a huge opportunity to transform your home’s exterior and boost curb appeal, even as you enjoy a suite of performance improvements. There’s only one catch: With so many garage doors on the market today, it can be difficult to choose just one, particularly if you’ve never before shopped for a new door. Don’t know where to begin? These guidelines can help you narrow your search to a door design that fits your needs and suits your preferences perfectly. DO select the right style. If a worn-out garage door can leave a first-time visitor with a bad impression of your home, the opposite must hold true as well. Upgrading your garage door will enhance the visual appeal not only of the garage, but of the entire exterior. Here’s the key: Select a door style that complements your house. 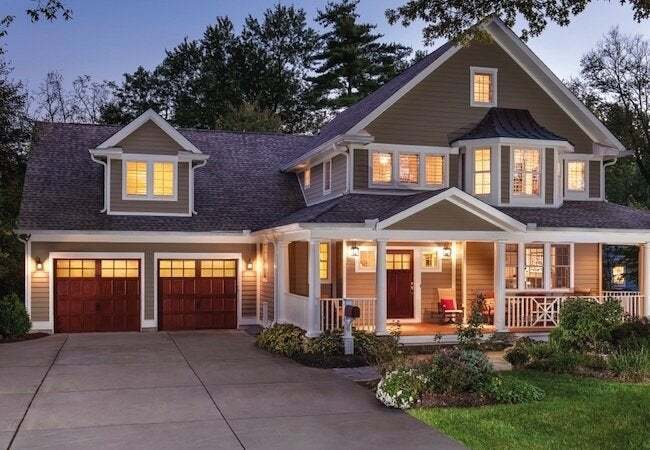 For instance, if you live in a Craftsman bungalow—distinguished by deeply overhanging eaves, extensive woodwork, and divided-light windows, look for a garage door that features the same hallmark characteristics. 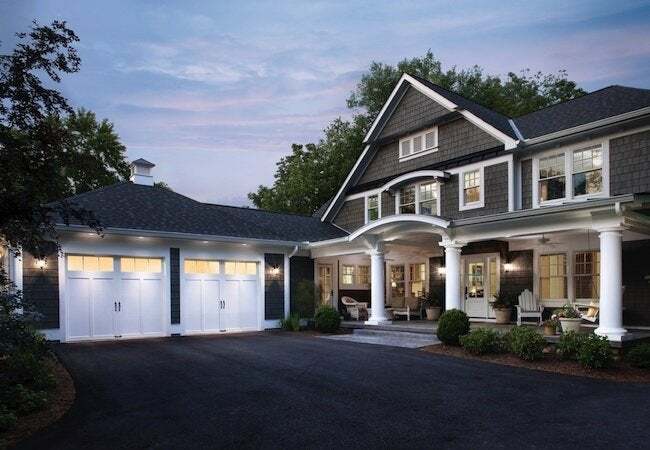 Meanwhile, if you live in a clean-lined modern home, concentrate on simple garage door designs with limited detailing, which will reinforce the streamlined appeal of the architecture. Rather than sticking out like a sore thumb and calling attention to itself, a successful selection looks right at home on the exterior. Garage door manufacturers offer no shortage of options, or if you have a specific vision, you can even design a custom door to your exact specifications. Many homeowners use the garage as their primary entrance. If you’re one of them, consider an insulated garage door. For one thing, insulation ensures greater comfort in the garage. In fact, on a cold day, a well-insulated door can keep the garage 10 to 20 degrees warmer, according to a study by conducted by residential garage door manufacturer Clopay. It’s not all about comfort, though. There are savings at stake, too, because as the largest opening in the home, the garage door can affect your home’s overall energy efficiency. In a home with conditioned living spaces next to and above the garage, a poorly sealed, uninsulated garage door can make the home’s climate-control system work harder (and consume more energy) to maintain the target temperature. By minimizing drafts and thermal energy transfer, an insulated garage door can help lower monthly utility bills. That said, much depends on the quality of the insulation. To understand the insulating capacity of a garage door, consult its listed R-value. The higher the R-value, the better the door’s performance. DO choose a practical door type. Different types of garage doors operate in different ways. Traditional swinging doors open outward from a central split, while others slide right to left like the entrance to an old barn. Far and away, one type surpasses the others in terms of popularity— overhead sectional doors. There are a couple of reasons why homeowners favor the convenience of an overhead sectional design. For one, in contrast to swing-style doors, which require ample clearance, sectional doors roll up and down on mounted tracks. And, overhead sectional doors are easy to pair with an automatic garage door opener. That’s not to say you can’t automate other types of garage doors, but doing so typically entails greater cost. You can get the best of worlds. Many garage door companies offer models that look like old-fashioned carriage house doors but operate with modern overhead convenience. As a hardworking component of today’s home, the garage door must be maintained properly in order to look and perform its best. Certain construction materials require more care than others. For instance, while there’s no denying the beauty of natural wood, some homeowners avoid it because it requires periodic refinishing. Other materials offer the look of wood with considerably less upkeep. Composite—a combination of wood fibers and synthetic resins—emulates the look of wood but provides superior durability, and won’t rot, warp or crack. Steel is a great option no matter where you live. But if you’re near the coast, you’ll need to wax your door like you would a car to prevent surface rust. The best advice: Understand the upkeep requirements of any door on your radar, and don’t commit to purchase one that you’re unable or unwilling to take care of. Due to their large size, garage doors are especially vulnerable to high winds. In fact, if a tornado or hurricane manages to break through the garage door, the resulting surge in air pressure can produce destructive, if not devastating, consequences. Unfortunately, there’s no such thing as a windproof garage door. But in many areas prone to severe storms, the municipal government requires code-compliant doors that can withstand a minimum level of wind resistance. To determine whether any such regulations apply in your neck of the woods, consult with county officials or a local garage door dealer. Wind-rated garage doors cost more than non-reinforced models, but there’s no discernible difference in exterior appearance. The heavy-duty parts that lend extra strength—reinforced struts, for example, or upgraded springing—are all inside the garage, behind the door itself. In other words, there’s no need to sacrifice curb appeal for storm preparedness, or vice versa. DO experiment with visualization tools. At the start of your search, it’s a good idea to visit a dealer showroom to get a sense of how different door styles and construction materials actually look and feel. Once you’ve narrowed your choices down to a few options, it can be helpful to experiment with an online visualization tool, like the Door Imagination System from Clopay. Here’s how it works: After uploading a photo of your home to the site, you can see how different garage door designs (and different combinations of windows, finishes, and hardware) would look on your home. Tools like this often make it easier to arrive at a final decision and add a bit of fun to the process. From style to construction material, from the R-value of the insulation to the presence or absence of windows—a number of variables can affect the final cost of a garage door. Prices run the gamut from a few hundred dollars to a few thousand (not including installation). It’s important to point out, that garage door replacement is one project that can increase the value of your home. In fact, among the most commonly completed home improvements, upgrading the garage door ranks near the very top of the list in terms of cost effectiveness and return on investment. In its annual Cost vs. Value Report, Remodeling magazine estimates that at resale, people recoup nearly the total sum invested in the project—91.5 percent, to be specific. It’s no wonder that for budget-savvy homeowners in pursuit of improved curb appeal, few projects are more exciting, more popular, or more rewarding. What are you waiting for?